Intriguing. Engaging. 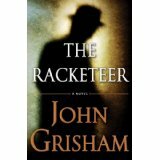 This new story, The Racketeer by John Grisham, slowly draws you into it. I felt a bit mesmerized to start, wondering when the action would start, but drawn into the story and not minding that it wasn't a high action plot. The story is told by the main character, Malcolm Bannister, a lawyer who finds himself embroiled in a racketeering scheme by association with one of his clients. He is spending ten years in prison unless he is able to pull off a deal with the government and judicial system which will set him free, solve a crime, and even solicit a little revenge on those who convicted him. Grisham cleverly lays out the plot giving you a taste and then a bite and just when you are swallowing, he brings on the next course. By the middle of the book I was so totally hooked by the story that I gave up on my to-do list and decided this was my priority. Pretty daring considering it was the Christmas season. I think this is one of Grisham's better books. An interesting note: At the end of the book Grisham, in his acknowledgements says research was not a priority. "Accuracy was not deemed crucial. Long paragraphs of fiction were used to avoid looking up facts." Then he goes on to disclaim some of the people and places he created as being anything near reality. I did feel a few areas seemed a little stretched but I do allow that a fiction writer writes just that--fiction.